By D Home | 6 years ago Our sixth annual look at the houses with the greatest curb appeal. By Rhonda Reinhart | 6 years ago Art, antiques, and family heirlooms fill the home of Dallas Flea founder Brittany Edwards Cobb. By D Magazine | 6 years ago In the D Home/Texas Paint & Wallpaper Life in Color contest, hue's the boss. By Laura Kostelny | 6 years ago Designer Doniphan Moore brings sophistication to a home at the Ashton. By Joslyn Taylor | 6 years ago The Brazilian interiors company offers modern solutions in the Design District. By Zac Crain | 6 years ago On growing up in a town that's no longer there. By D Magazine | 6 years ago They've set up shop outside New York City for the first time in their 115-year history. By D Magazine | 6 years ago Snap up this Prairie-style gem, if you still can. By Laura Kostelny | 6 years ago Michael Wilson creates fantastic pieces in his Wimberley, Texas, studio. By Joslyn Taylor | 6 years ago The Joule hotel welcomes the L.A. boutique. 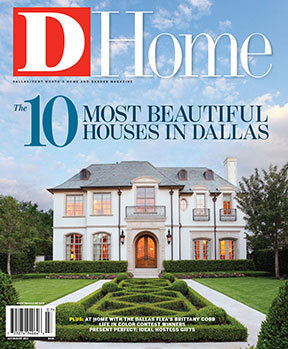 By D Magazine | 6 years ago Three bedrooms in the Urban Reserve, and M Streets Tudor, or a Devonshire cottage. By D Magazine | 6 years ago A Georgian revival, a midcentury modern, or a totally updated 1962 home. By D Magazine | 6 years ago A space for 1,200 bottles of wine, a negative-edge pool, or a state-of-the-art media room.